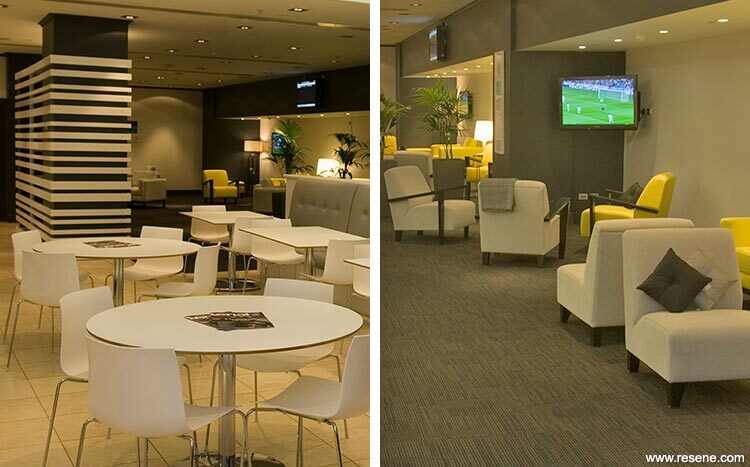 Stephenson & Turner (S&T) was engaged by Auckland Airport to upgrade an existing lounge which was originally explored to test a business case. 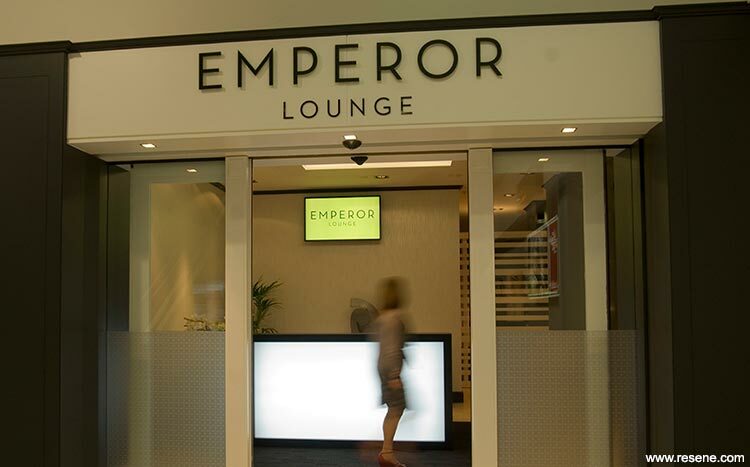 The new Emperor Lounge was delivered on a very tight budget and time frame. 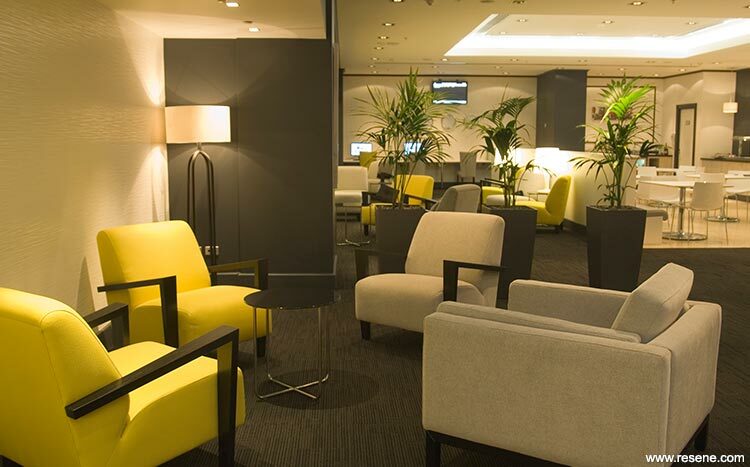 The scheme is designed around the concept of ‘calm’, offering passengers a chance to relax and de-stress before boarding. A specially designed study area was incorporated for those needing to catch up on work, while shower facilities provide the opportunity to freshen up before a long haul. There is also a small cafe area for light meals and refreshments. S&T designed this space to have plenty of gentle light and simple, clean colours and textures. The light and dark tones that merge from one surface into another cleverly give the impression of both space and seclusion. Crisp lines frame the spaces and evoke order and calm, helping to untangle the pressured and disordered experiences of what travel can be like. Chairs arranged in circles are a warm, inviting contrast and reflect the finishes that blend from floor to wall; creating a sense of being ‘cocooned’ in a safe, calm environment. 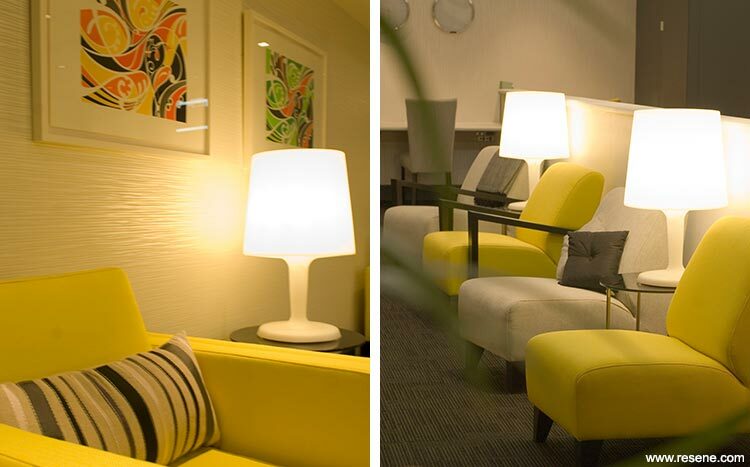 Textures, elements, and colour all contribute to this ‘oasis’ inside Auckland Airport, giving passengers a lasting experience of the peace and tranquillity of New Zealand. A space that makes one feel special. A light environment; hiding the fact that the space has no natural light. Different types of spaces were created by playing with the application of lines in the form of Resene wallpaper (Wild Life – Fauna). For areas where ‘retreat’ was required, the wallpaper was applied horizontally, creating a sense of calm and envelopment. In areas such as the computer lounge, where higher energy was required, the same wallpaper was applied vertically. To keep the space light and airy, most walls were painted in Resene Alabaster. Existing columns, feature walls and skirtings were highlighted with Resene Foundry, framing the light Resene Alabaster painted walls. The doors were finished in Resene Quarter Delta. The floor finish connects the vertical wall lines by means of a horizontal pattern and colour depicting Resene Foundry, ensuring that the energy created has a constant flow and continuation. Soft furnishings employed colours and textures that work seamlessly and harmoniously with the underlying neutral colour palette, with subtle accents of sunny yellow to achieve a warm and comforting ambient space. 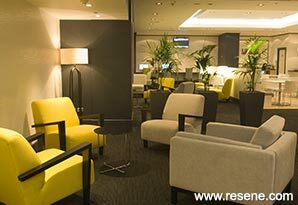 The lounge was also awarded the best third party lounge in the world by Malaysian Airlines.